Distributor of environmental rental equipment including photoionization detectors, remediation equipment & meters. ISO 9002 certified custom manufacturer of soil remediation systems including air pollution control blowers. For use in environmental applications. RoHS compliant. Manufacturer & distributor of soil remediation products & systems for control, extraction & destruction of vapors from soil venting systems. Packaged process air heaters, computer software for combustion and air handling systems, energy recovery systems, coil coating line systems. Distributor of air compressors, vacuum pumps, pneumatic tools & equipment, sand blasting products, & air compressor, blower, & vacuum systems. Paint sprayers, equipment, supplies, booths, & systems. Engineering & design consultants. Inhouse service, installation & rental services. ISO 9001: 2000 certified distributor of soil remediation equipment & systems including positive displacement blowers, high & medium regenerative blowers, & centrifugal blowers. Features include compact modular design, dry pumping chambers, & separate pressure & vacuum chambers. Manufacturer of soil remediation systems including oxidizers. Systems can be skid or trailer mounted with integrated positive displacement or liquid ring blowers capable of providing inlet vacuum up to 14 in. of mercury (higher vacuums available with liquid ring blowers). Single & multistage centrifugal blowers & exhausters, Power Mizer® cast blowers, gas boosters (UL listed), Vortex® regenerative blowers, positive displacement packages for air & gas handling. Custom designs & special materials fabrication. Plants for: thermal treatment of domestic refuse, industrial, hazardous & liquid wastes, wastewater & sewage sludge. Manufacturer of rotary calciners for indirect processing under oxidizing, reducing or inert atmospheric conditions. Applications include those that require retention times ranging from a few minutes up to several hours, non-contact with products of combustion & bed temperature profiling. Manufacturer & distributor of pollution control equipment including soil pollution equipment. Soil remediation systems . Environmental consultants offering environmental engineering services, environment management services, & environmental investigations. Environmental investigations include environmental audits, hazardous waste management, & phase I & II studies. 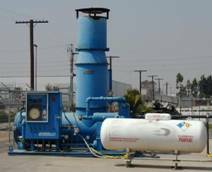 Design & Mfg Direct (Convection) & Indirect (Conductive) Complete Thermal Soil Remediation Plants. Portable, Stationary, Transportable. CE Rated For Outside USA. Manufacturer, design, fabrication & installation of integrated groundwater & soil remediation systems . 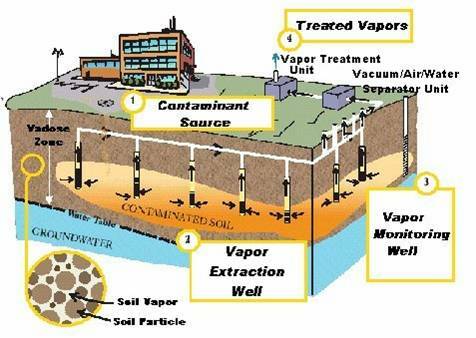 Soil vapor extraction (SVE) uses vacuum pressure to remove volatile and some semi-volatile contaminants ( VOCs and SVOCs) from the soil. The gas leaving the soil may be treated or destroyed, depending on local and state air discharge regulations. Extraction wells are typically used at depths of 5 feet or greater, and have been successfully applied as deep as 91 meters (300 feet). Groundwater pumps may be used in conjunction with SVE to keep groundwater from rising into the unsaturated zone as a result of vacuum pressure, or to increase the depth of the unsaturated zone. This area, called the capillary fringe, is often highly contaminated, as it holds undissolved chemicals, chemicals that are lighter than water, and vapors that have escaped from the dissolved groundwater below. In soils where the contamination is deep or when there is low permeability, injecting air into the soil helps extraction. During full-scale operation, SVE can be run intermittently (pulsed operation) once the extracted mass removal rate has reached a steady state level. Because the process involves the continuous flow of air through the soil, it often promotes biodegradation of low-volatility organic compounds that may be present. SVE can also be used on piles of excavated soil. A vacuum is applied to a network of aboveground piping to encourage volatilization of organics from the excavated media. The process includes a system for handling off-gases . Soil with high moisture requires higher vacuums, hindering the operation of the SVE system. Soils with high organic content or soils that are extremely dry have a high sorption capacity of VOCs. These conditions limit the effectiveness of SVE. Soils with low permeability also limit the effectiveness of SVE. Because SVE applies vacuum pressure to subsurface soils, it can raise groundwater levels. As soil becomes saturated, some contaminants may dissolve into the water. As a result, groundwater could show increases in contamination levels, especially when this process begins. SVE will not remove heavy oils, metals, PCBs, or dioxins. Exhaust air from in-situ SVE system may require treatment. Off-gas treatment usually involves vapor-phase Granular Activated Carbon (GAC) . SVE is not effective in the saturated zone. A field pilot study is necessary to establish the feasibility of the method as well as to obtain information necessary to design and configure the system. The technology is typically applicable for soil with VOC and/or fuels contamination. SVE works only on compounds which readily vaporize (i.e., with a high Henry's law constant).